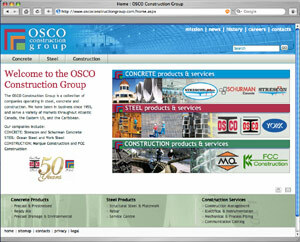 The OSCO Construction Group is pleased to introduce www.oscoconstructiongroup.com , the new internet home of: Ocean Steel, Strescon, York Steel, Marque Construction, FCC Construction, and Schurman Concrete. This new team website now mirrors the teamwork of our everyday operations, in which our companies work together to ensure our customers receive quality products and services that meet or exceed their needs. With our focus on teamwork, it was the logical step to bring everyone together under one website banner so customers would understand that they could "one stop shop" with us, to make their lives easier... Why coordinate separate, unrelated companies, when you can hire a team who coordinates themselves? When one or more of our companies are hired for a job, you can be assured that separately or as a team... we provide quality work you can count on. An integral part of this new website is the flexibility to keep it current with upcoming news, events and product profiles. This website will not be a stagnant one. Instead, it will continuously evolve as team members add content in an effort to keep it relevant and informative. We hope you will visit often and send us your comments and suggestions.